VERONA - Marianne Gill-Volker, age 72, of Verona, died on Wednesday, July 8, 2015, in a Madison hospital. She was born on May 3, 1943, in Ketchikan, Alaska, the daughter of Harold and Virginia (Blanchar) Rooney. Marianne graduated from Madison West High School in 1961. She worked at various businesses in Madison, including UW Hospital, Edgewood High School and Capitol Lawn Sprinkler. She married John Volker on Nov. 4, 2000. Marianne had many hobbies and interests. She loved 1930's music, classic movies, playing bridge, trivia, gardening, crossword puzzles and golf. She was also very involved with the Verona Area Community Theater. 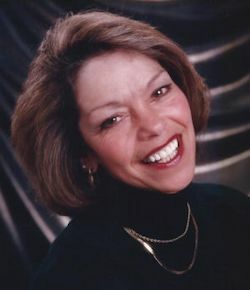 She is survived by her husband, John Volker of Verona; and three children, Peter (Jennifer) Gill, Jeffrey (Patricia Stindt) Gill and Kelly Gill, all of Madison. She is also survived by three stepchildren, Kendra (Paul) Trilling of Sun Prairie, Karla Volker of Monona, and Kevin (Megan) Volker of Fitchburg; a brother, William (Patriece) Rooney of Red Wing, Minn.; and a sister, Maureen (Dennis) Welsch of White Bear Lake, Minn. She is further survived by three grandchildren, Magdalana, Johnathan and Ellianna Trilling; three stepgrandchildren, Avery and Drew Brandt, and Luci Okey; and several nieces and nephews. In addition to her parents, she was preceded in death by her loving dog, Elroy. A Mass of Christian Burial will be held on Wednesday, July 15, 2015, at ST. ANDREW CATHOLIC CHURCH, 301 N. Main St., Verona, at 10:30 a.m., with Father William Vernon presiding. A visitation will be held at the church on Wednesday from 9 a.m. until time of service. In lieu of flowers, memorials may be made to the Verona Area Community Theater, 405 Bruce St., Verona, WI 53593.